Customer retention is key. Most marketing budgets center around getting a company’s message out to the masses. TV commercials, print ads, billboards, sponsorships, direct mail, are all forms of external advertising that are commonly used to attract new customers to businesses. But once you bring someone in, what are you doing to get them to come back? Companies that have to advertise all of the time in order to stay in business are likely not doing enough to keep their customers happy. Many business owners focus most of their efforts on attracting new customers in order to make more money. But you don’t only need new customers! If your goal this year was to grow your revenues by 10%, would you care if that increase came from new business, or increasing the average spend from your current customers? Of course not! More revenue is more revenue. They look the same, don’t they? Because they are! An added dollar earned from an existing customer is just as good as a dollar form a new one. But it’s proven to earn that extra dollar from an existing customer than to get it from a new one. It’s Relevant TV has come up with an easy way to increase customer retention (getting customers to come back more often). Each custom TV network IRTV creates is unique to each business that displays it. Short-form TV programs grab the attention of visitors while the integrated real-time social media and promotional tools help get the business’ message across. 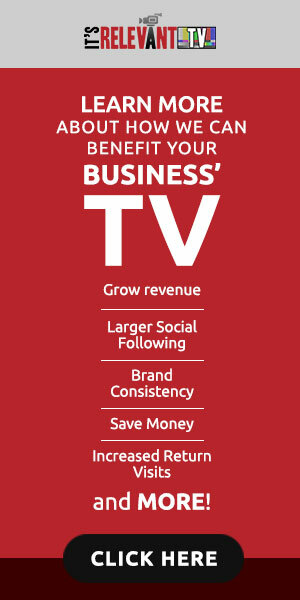 If you own or manage a business and have a TV, It’s Relevant TV offers a free consultation. You can explore various types of programming with an expert and start to craft something that will do much more for your business.